$1,600.00 $530.00 Only 10 Left! 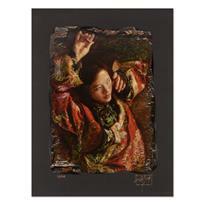 "Red Butterfly" is a limited edition chiarograph on black paper by George Tsui, numbered and hand signed by the artist. Includes Letter of Authenticity. Measures approx. 18" x 24" (border); 13" x 20" (image). Due to the nature of the paper, there may be very minor scuffs in the border area that may be concealed when framed. George Tsui was born in Hong Kong, and moved to New York in the late 60s, studying first at the School of Visual Arts and later majoring in oil painting at the Art Students League. Included in Tsui's works of that period are some movie posters, several paintings chosen for the 1984 Winter Olympics poster series, as well as limited edition art prints for the 1985 and 1986 Night of 100 Stars event for a tribute to The Centennial of The Actor's Fund of America. Tsui went on to work at NBC where he was awarded the prestigious 1997 Emmy Award for Best Individual Art and Craft. 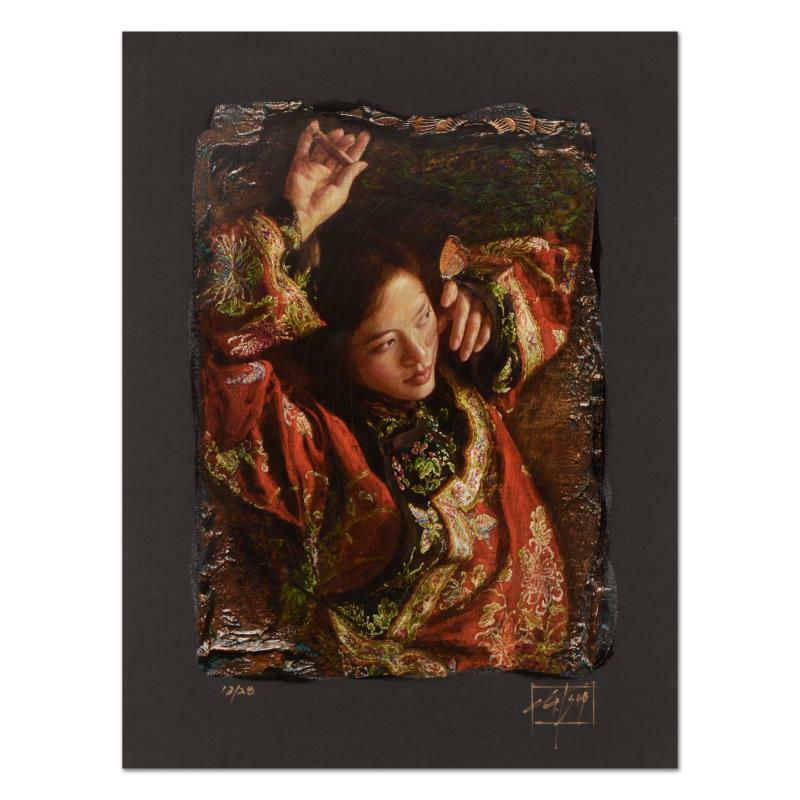 After twenty years in the New York art scene, Tsui embarked on a creative journey into China in the pursuit of reaching the next level in his artistic career. The grand and splendid architecture of the forbidden city and the mysterious and sensual character of the Dun Huang cave were his most immediate inspiration. Always fascinated and attracted to the rare and exotic, elements of fantasy are often present in Tsui's work. Chinese themes filled his imagination, and the idea of creating his own brand of classic romanticism, unrestrained by conventional reality, was deeply attractive to him. 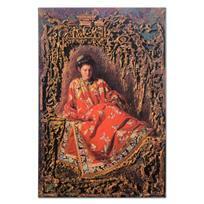 His models always dressed in exquisite silk gowns from the artist's personal collection of 20 authentic imperial dresses. 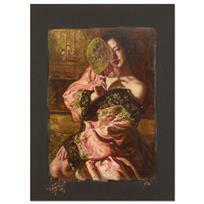 They pose in romantic, luxurious surroundings with a variety of antiques, artifacts, jewelry, flowers and birds. As the artist describes, "These pieces employ a dual technique of painting and sculpture that is traditionally ornate, yet abstract in the most modern sense of the word." 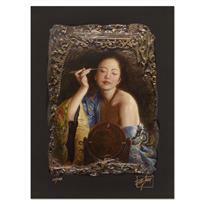 George Tsui, "Painting Eyebrow" Limited Edition Chiarograph, Numbered and Hand Signed with Letter of Authenticity.